When I first designed these, their stats were much lower, as I intended swarms of them and worried about overwhelming the players. There were two issues with this when I ran my session last night: First, Savage Worlds handles Extras so much better than most games I run, there were three Xitcix for each player and it hummed along just fine. And Second, I forgot about PC's in Savage Worlds. So they are more beefed up. 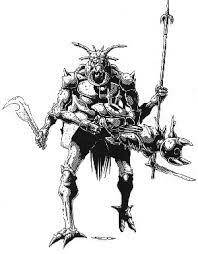 Th Xiticix are humanoid insects from another dimension that have plagued Rifts Earth for nearly thirty years. Pace: 6 (Flying 12); Parry: 6/7; Toughness: 13 (8) M.D.C.